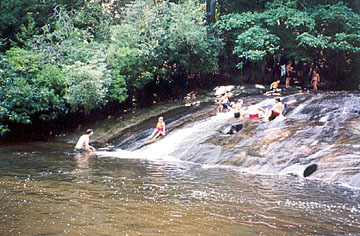 Brevard has its sliding rock, and so does Cashiers - on the infant Chattooga! 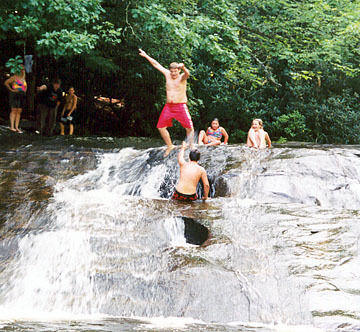 The Chattooga River starts as thousands of trickles at Whitesides Mountain between Cashiers and Highlands. Before it becomes the stateline between Georgia and South Carolina, the river serves as the dividing line for Jackson and Macon counties in North Carolina. Just off Whitesides Cove Road (south of Cashiers), the Chattooga glides over a 10-foot high rock face pockmarked with a few large potholes. 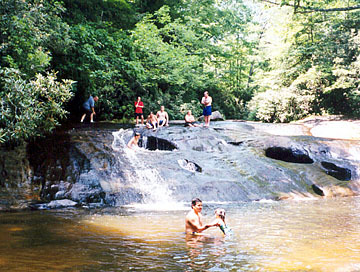 The site is a popular local spot during the summer because the water is quite cool. You can slide down the rock, cannonball into one of the potholes (see the picture below) or just wade in the pool below the rock. However, be very careful! This is forest service property, but no safety precautions have been made and no lifeguards are provided. Directions: From the intersection of NC 107 and US 64 in Cashiers, follow NC 107 south for a mile or so to Whitesides Cove Road. Look for the golf course hole on the right to be sure you are at the correct spot. Turn right onto Whitesides Cove Road and follow it downhill to the bridge over the Chattooga. Park along the road at the bridge (don't block the driveway) or drive up the hill to a pulloff on the right. Follow one of the numerous paths upstream to the sliding rock and pool.